sorry no ETA yet… the chips are made, we are just now waiting for syringes, sterilization pouches, and EO sterilization itself. Once we receive them from our factory we’ll be shipping out ASAP. Thank you sir, sounds like I have time to also snag an xEM and just get two at once lol. is it possible to buy a microchip xM1 + without the injection kit? If so, how long would it take to send the parcel, will it be faster? Full kits with xM1+ injectors should be shipping by mid-November, but yes we can ship just the xM1+ in a small tube with chlorhexidine. If this is what you want to do, reply to the order details email you received from Dangerous Things when ordering and request your xM1+ be shipped without the injector. 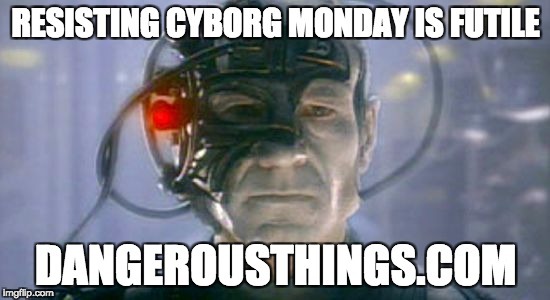 Enter coupon code cyborgmonday at checkout to get 50% off many of our most popular implants! Unfortunately, this is no longer available and we currently do not have plans to pursue replenishing stock of the xM1+ in the near future.